THERE IS NO 12-STEP PROGRAM FOR BEADERS. When the internet was young, I belonged to a very active bead chat group on AOL. Beaders from across the country would exchange ideas there and as a matter of fact, I met some local beaders including Sue Everett (BeadGal, aka MiyukiGal.) On sojourns to bead shows in other states, I also met members from across the country. Some of them are friends to this day. It was an active and enjoyable group. One of the things that was the most fun was the monthly bead swap. In fact, I understand that it is still ongoing. I thought I would write a little something about it for two reasons – it was a blast, and it could be something you might like to do in your own group bead society, either informally or through a Yahoo group. The bead swaps worked like this: Someone would volunteer to be the “Swapmeister” for a particular month. The Swapmeister would determine the theme of the swap, along with any “extras.” (I’ll get to the “extras” part later.) For instance, a swap theme might be “Beach Sunset.” If you wanted to participate, you e-mailed the Swapmeister. The Swapmeister would set a date for swappers to get their beads in. If a swap had 15 people signed up, each person would prepare 15 bags of beads, each one with the approximate value of $1.00 and appropriate to the theme, and send them to the Swapmeister, along with a self-addressed stamped priority mail envelope. When the Swapmeister had all the bags of beads, she would mail each person a package which contained one each of the bags received from the other swappers. The exciting part of it was seeing what others came up with – my idea of “Beach Sunset” might be very different from yours! It was also fun to see if you could come up with a piece made from all of the beads you received. 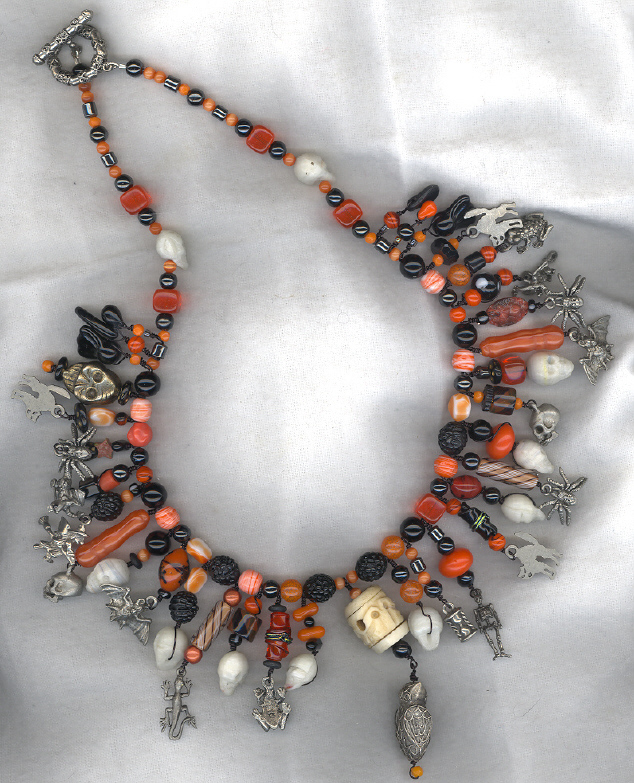 One of my favorite necklaces is a Halloween-themed necklace made up of swap beads – you can see it below (click on it to see a larger version). I added the charms but all of the beads came from a Halloween swap. The swaps often had color themes, but another memorable swap, which I hosted, was “Just Say No to Druks.” Druks, as most of you know, is a term for round beads. So, for this swap you had to send shape beads, no rounds. As for the “extras” I mentioned, a Swapmeister might request that each swapper send a recipe, a favorite poem or saying, or a short bio, for instance. This was just a way for us to get to know each other and add a little something fun to the swaps. I remember a swap with a “favorite quotation” extra – there were some beautiful sentiments, but one swapper’s favorite was “Whatever.” As I got to know her over the years, it turned out to be quite apropos. Some of my favorite beads came from the swaps, including some very cool slices of sea urchin spine made into beads, and some snake vertabra! If you decide to give bead swaps a try, be sure to set the rules out very clearly. You may decide, for instance, that you don’t want seed beads in your swap, as they are difficult to quantify.